There are days when my body just craves something light and fresh. Do you feel the same way? That feeling generally comes after a few days of a lot of rich food and too much wine. The following day was spent recovering and eating carbs…. lots of carbs (it’s what I crave when I’ve had a little too much to drink). Once I came out of my wine/carb coma, I was feeling tired and sluggish. I craved something nourishing and this Asian Style Tofu Buddha Bowl did the trick! It was like a total body reboot. I felt less bloated and like I had more energy. The additional beauty of this bowl, is it’s completely customizable! If you prefer brown rice or farro over the quinoa, use it. Use whatever veggies you like, and if you’d like to use grilled chicken breast or fish, go for it! It’s still makes a delicious and nutritious bowl! 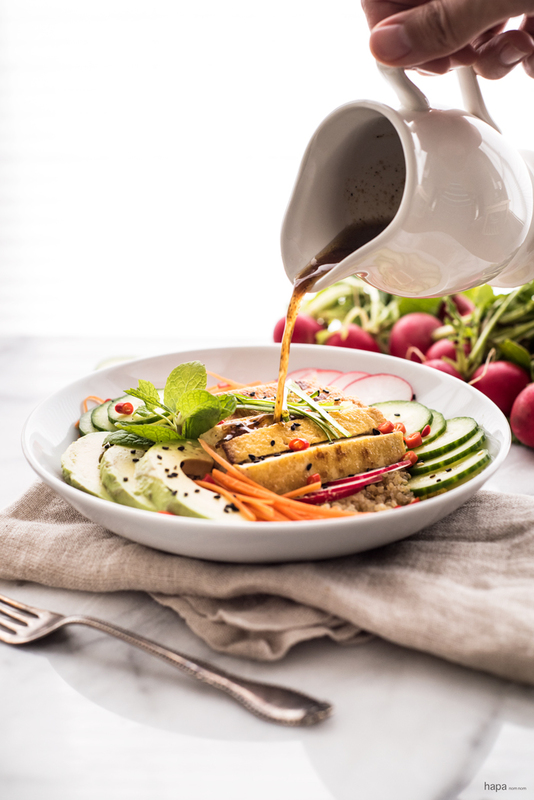 30 minute Asian-Style Tofu Buddha Bowl with a sesame-lime dressing. Vegan friendly, nourishing, and delicious! While the quinoa is cooking, heat the grapeseed oil in a large skillet over high heat (this is for cooking the tofu). While the pan is heating, set the tofu down on a cutting board. Place your knife, parallel to the cutting board and slice the tofu in half so that you have two plank-like pieces. Place both pieces between paper towels and pat dry. Season both sides liberally with salt and pepper, and place the pieces in the hot pan. Sear both sides for 2-5 minutes, or until the outside is golden-brown and crispy. Remove from heat and allow to cool on a paper towel-line plate. Once cool enough to handle, slice into strips. Divide the quinoa evenly among two bowls. Add the veggies, the tofu, and garnish with chilies, mint, and black sesame seeds. Serve with the dressing (stir just before dressing the salad) and enjoy! * If you don't want to use quinoa, feel free to use any type of rice or farro. * If you can't find super firm tofu, find the firmest tofu you can. Then take a plate and line it with paper towels. Place the tofu block on the paper towel-line plate and put another layer of paper towels on top of the tofu. Place another plate on top and then weigh it down with heavy cans for at least 1 hour. * For faster prep, you can shave the carrot into strips with a vegetable peeler. Yum this looks absolutely amazing! And your photos are stunning, as usual. Pinning this! 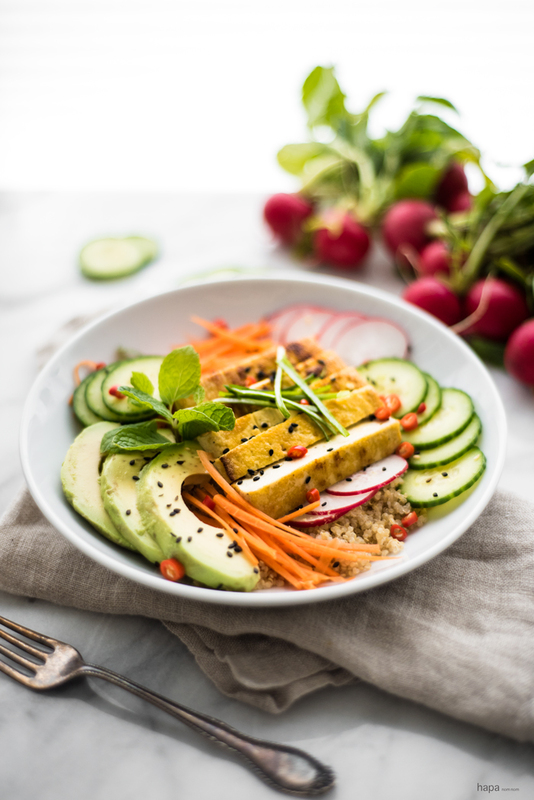 This Asian style Buddha bowl looks so delish and light — so Bright and YUM! And that dressing looks absolute YUM! Just looking at the ingredients asian dressing is enough to convince me that this is a delicious bowl of salad! There’s nothing like spending time with good food, good drinks, food friends, and fantastic scenery. Your Valentine’s weekend sounds wonderful! 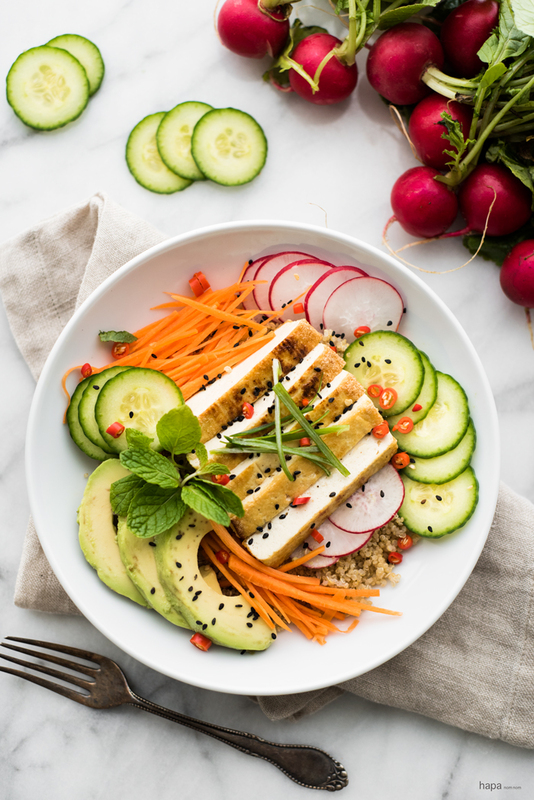 This tofu buddha bowl is perfect dish when I need a total body reboot…light, healthy, delicious! Eating it would definitely make me feel more balanced. Oh, Kathleen, I needed to read this today! I would be thoroughly ashamed to tell you what I’ve eaten over the last few days, culminating in what must be the worst Chinese takeaway I’ve ever had. Horrible! Even just seeing this beautiful wholesome bowl of food makes me feel better. Such gorgeous photos, too! I don’t like tofu that much, but I will try your recipe to find out whether it is something I could like :). It’s such a perfect & colorful bowl, real yum! Sounds like you had a fabulous Valentines day, Kathleen! I’m jealous for sure! Nothing like a winery and a good food coma. 😉 I have been on a buddha bowl craving kick like a mad woman, so I can’t wait to add this bowl to my arsenal! These look seriously delicious, doll! SO much yum and healthy to boot! What’s not to love?! Cheers, sweets! Aren’t buddha bowls great?! Seriously, the sky’s the limit with these babies! Yes! I was thinking the same thing – I packed it for my husbands lunch and it worked out perfectly. You? Bloated?? Yeah right! Me – bloated. Permanently. I need these bowls. If it gets me 1mm more towards your gorgeous bod, I’m there. I am totally with you on the light and fresh food days. . this is freaking gorgeous!!! Glad you guys had a nice Valentine’s Day! And carbs are perfect for recovering 🙂 This Buddha bowl looks amazing! Your Valentine’s Day sounds awesome! No judgments on the wine! I wish we could have hung out with you guys! Your buddha bowl sound like the perfect recovery from so much wonderful indulgence! Delicious recovery bowl!!! So bright and cheery!